To tie in with the upcoming exhibition on vaccination in the LSHTM’s Keppel Street foyer, we are organising a half day symposium. The half day symposium, organised by the Centre for History in Public Health and the Vaccine Centre, will be on 17 June 3pm-5pm. It will be in the John Snow Lecture Theatre, London School of Hygiene & Tropical Medicine. Anne Hardy, Honorary Professor at the Centre for History in Public Health, London School of Hygiene & Tropical Medicine, who will be talking about smallpox vaccination in the nineteenth century. Dora Vargha, Postdoctoral Research Associate at the Reluctant Internationalists Project, Birkbeck, University of London, who will detail the local challenges in global vaccination in the Cold War through the story of the Salk vaccine. Pauline Paterson and Tracey Chantler, from the NIHR Health Protection Research Unit in Immunisation and the Vaccine Confidence Project will talk about trust in vaccines, past and present. to put your name on the list. The symposium will be followed by a wine reception. 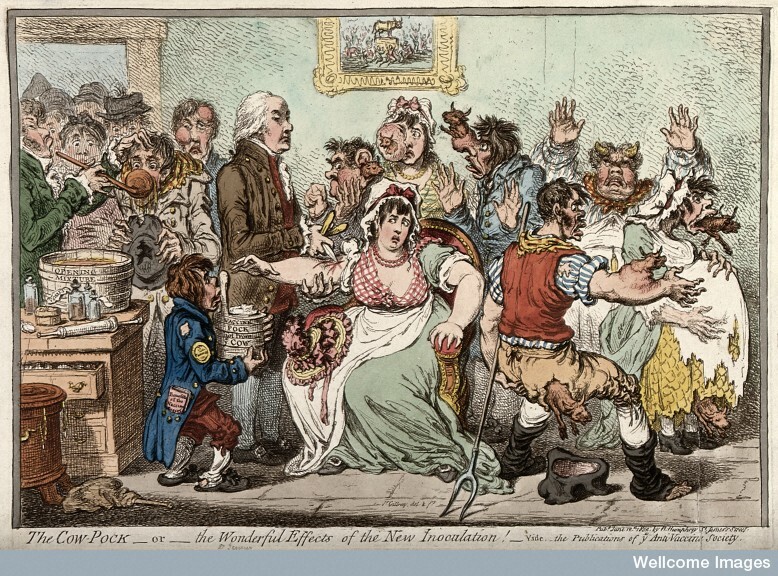 Caricature of Edward Jenner inoculating patients in the Smallpox and Inoculation Hospital at St. Pancras. James Gillray, 1802.